Cycle Care Matt Paints Cleaner Spray on, Wipe off instant detailer specifically formulated for matt (flat) finish colors. Motul Mo Cool Radiator Additive Motul's new coolant additive improves heat transfer, reduces corrosion and can be used with other motul and motorcycle specific coolants or with distilled water only for upto 20F lower coolant temps. Motion Pro Cable Lube 6oz. 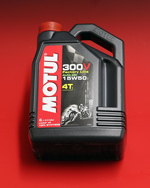 Motul Moto Wash Spray Biodegradable Cleaner/Degreaser. Water Wetter Coolant Additive 12oz. Racing organizations do not allow you to run coolant in race bikes. Water wetter replaces the anti-corrosive and lubrication offered by coolant, and is approved by all racing organizations. Motul Chain Lube Aerosol Style Spray C4 -RACE Motul Chain Lube is a colorless lubricant specifically formulated to lubricate all standard, O-Ring, X-ring, and Z-Ring Chains without high speed splatters. Motul Chain Lube Aerosol Style Spray C2 -ROAD Motul Chain Lube is a colorless lubricant specifically formulated to lubricate all standard, O-Ring, X-ring, and Z-Ring Chains without high speed splatters. Better than Plexus. Cuts grime and bugs and leaves a nice wax shine. Permatex Threadlocker Green 6ml size Permatex's Threadlocker Green is commonly used to secure set screws for final assembly and to fill voids of upto .005"
Star Tron Enzyme Fuel Treatment - 235mL (ex WP571140) Aprilia's recommended Fuel additive for storage and prevention of ethanol related fuel system problems. Star Tron Enzyme Fuel Treatment - 60mL Aprilia's recommended Fuel additive for storage and prevention of ethanol related fuel system problems. Star Tron Enzyme Fuel Treatment - 30mL Aprilia's recommended Fuel additive for storage and prevention of ethanol related fuel system problems.